If your boss challenges you to walk your way to work for one day, would you do it? Just by thinking about it, you might already find yourself pretty exhausted, especially if your place is nearly five miles away. Why would one even bother wasting his or her time taking steps when there’s always the car or public transport? While it may sound like complete nonsense to you, walking to work can actually help you in so many ways. 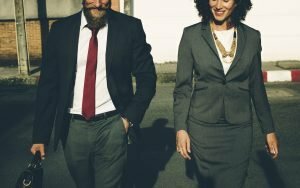 Since walking provides a lot of health benefits, Prevention Magazine came up with an idea to give everyone the chance to experience traveling to their workplace by foot. This idea was later on approved by the U.S. Department of Health and Human Services and the American Podiatric Medical Association, which would be known as the Walk to Work Day. Feeling guilty about devouring a Big Mac? Better prepare yourself for an hour and a half of walking! Yes, that’s what it takes to burn those 540 calories off. We use 200 muscles to take a single step forward. It takes 200 steps to complete a regular city block. It would take the average person 347 days to walk (without stopping) around the world. If you want to lose weight by walking, try doing it at a moderate pace while extending the distance further. Walking reduces the chances of cardiovascular disease and obesity. Having a bad day? Go for a stroll. Walking helps lighten up one’s mood. What’s the deal with Walk to Work Day? Celebrated by Americans annually on the first Friday of April, this unofficial holiday aims to promote health and wellness among the community. It began in 2004 and continues to be observed by many in the country. The goal of the event is to raise public awareness about the physical and mental benefits of walking. It encourages citizens to ditch the car and use their legs to commute instead. If you haven’t participated in the event yet, now would be a good time. Besides the fact that you’ll be meeting lots of new people in your area, you also get to appreciate the scenic route that you’re about to take on your way to work. Make sure to set your alarm early the night before the event takes place. Better yet, sleep earlier than usual. Plan your route. Know the shortcuts in advance. It’s always better to come prepared. Have a light breakfast. A single cup of Joe will do. Wear comfortable shoes. If your work shoes aren’t made for walking, especially for the ladies, it’s best that you bring along a pair of sports shoes with you. That way, you can spare yourself from the blisters the following day. Bring extra clothes and towel. Invite one of your co-workers to tag along if you like. It’ll be more fun and less tiring. You can even be each other’s motivator. If your office is too far, take the public transportation and walk your way to work from the train or bus stop instead. While maintaining a healthy lifestyle takes a lot of commitment, imagine how much of it our veterans have when they’ve decided to join the military as volunteers to protect us at all cost. Walking to work only requires one single day of sacrificing your early morning routine. Our retired troops have gotten used to the noble deed of making sacrifices. Imagine all the pain and struggle they had endured while on duty. Let’s honor their heroism with a car donation. Contact us at Veteran Car Donations today at 877-594-5822 or start the donation process by filling out our online donation form.